A new study suggests that reach-training for infants could help development. Is It Time to Start Reach-Training Your Baby? 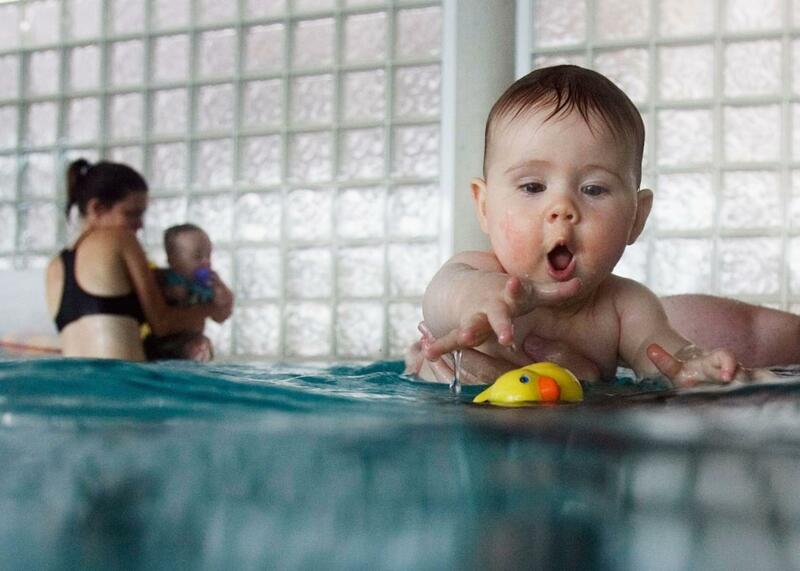 A toddler reaches for a rubber duck during a swimming class in Sydney, Australia. Is it a sign of precocity? The first time a baby reaches for an object isn’t on most parents’ checklist of significant, or even particularly adorable, milestones. But a new study suggests that the act of reaching is a crucial part of a child’s development that, when mastered early, can lead to better motor skills, attention spans, and even vocabularies later on. Researchers at the University of Pittsburgh were interested in the effects of different types of reach-training on infants’ development. They instructed 25 mothers of three-month-olds to engage with their children on reach-related activities for ten minutes a day over the course of two weeks. Some of the mothers were given Velcro mittens for the babies to wear, as well as Velcroed toys for them to grab. The remaining mothers were also given mittens and toys, but without the Velcro. The children who wore the Velcro mittens were more likely to establish contact, whether accidentally or on purpose, with the toys. This, the researchers hypothesized, created an incentive for them to continue reaching. When the children reached 15 months, the researchers recorded them playing with a bead-maze toy and used a frame-by-frame coding software to track the children’s visual and physical engagement with it. They also had parents filled out a survey in which they rated their child’s temperament. They discovered that the babies who had done the reach-training with the Velcro mittens and toys had more advanced motor skills and longer attention spans than those who did not, after researchers accounted for any differences in grasping abilities before the training. The results were published in Developmental Science. Psychologists call these types of results a “developmental cascade,” meaning that the early adoption of one skill can lead to the learning of a number of other skills and therefore affect the child’s overall long-term development. In this case, the act of reaching teaches children to focus and interact with world around her or him. That interaction can lead to more verbal attention from her or his parents, which is crucial for language development. The University of Pittsburgh study was small, and more research is needed to establish the usefulness of reach training, but it’s not hard to imagine how some parents could take this finding too far. I can already see the organic Velcro mitten boutique in Silver Lake, or the $70-an-hour reach-training classes in Brooklyn. There will also be a lot of parents who interpret these findings as yet another thing to feel nervous about. I can envision the ticker-tape of anxieties that this will set off in many moms’ and dads’ minds: Is my son not reaching enough? Should I have taken him to one of those $70-an-hour classes? How will he get into college? And will Cassie please stop bragging about her baby’s reaching on Instagram? But potential hysterical responses of wealthy parents aside, there’s an important message in these findings that is well worth paying attention to. It’s only been in the past decade or so that we’ve begun to have substantive conversations about the importance of early-childhood development and the power of intervention. Research coming from Harvard’s Center of the Developing Child, which was founded in 2006, makes it quite clear how crucial the early years are for children in terms of emotional and cognitive development. Also, interventions into early childhood development have had positive lasting effects on underprivileged children. The reach-training study only adds to the evidence of the importance of the early years, and is another reason why more public investment into early childhood education should happen sooner rather than later.